Sheffield Lab Recordings has released a new Harry James CD set with all their original direct to disk recordings. This is a great opportunity for audiophiles and trumpet fans to have a collection of one of the trumpet greats, Harry James, recorded at the highest standards. At the time, Harry James said, "In 36 years of recording, I have never been so pleased with the sound." 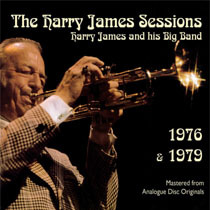 The CD set is a reissue of a historic recording: The Harry James Sessions. Consisting of three albums originally recorded direct-to-disc by Sheffield in 1976 and 1979, and now spectacularly re-mastered by Seth Winner from analog disc originals, this program of music from the height of the swing era is a vital representation of one of the great big bands of the 20th century. To hear this music recorded by Sheffield from the perspective of a single stereo microphone, is to hear this magnificent band as dancers heard it in front of the bandstand, with the impact and energy that we don't associate with historic recordings of another era. Pretty thrilling stuff! This is a multiple CD set. We do not have vinyl.